Want to decorate your home with DIY crafts? Mason jars crafts are easy, and you can complete them in a few hours. Here are 20 excellent and creative ideas. If you asked us what are the most popular crafts in home decor, we’d say that without a doubt it’s mason jars. First, they are very easy to make. Secondly, the variations and uses for them are endless. You can easily make unique decor over an hour and be proud of it. So here are our favorite DIY mason jar crafts that you can do too. What Do You Put in Decorative Mason Jars? And we can continue the list; the inspiration is endless. Next are 20 of our favorite mason car craft tutorials. This is quite a creative project that plays with light. All you need is a mason jar (of course) and a bunch of glass crystals or other glass details that you can glue to the surface of a jar. Add a candle inside and enjoy the lights. This one works best with a tinted glass jar, and you get a nautical themed vase or a storage container. There’s quite some room for creativity in choosing materials and knotting but you can experiment for the result you’ll love. There are many ways how you can paint a mason jar, but this chalkboard paint distressed look makes really awesome vases or storage containers for small things. Yes, mason jars can make pretty great soap dispensers too, and they make a nice bathroom decor statement to go with it. That chic rustic look of a distressed mason jar is really the thing. So here’s another way how to do it. Even simple things like tissue holders look so much better when they are made from hand decorated mason jars. Be creative even in the least expected places. One of the best things you can do from a mason jar is your very own homemade candle. These things are quite impressive and even make a nice gift to someone. Among other things, mason jars make great holders for pens, pencils, and markers. So here are some you can make for your office desk or your kids. Create a decorative aquarium for a beach themed vignette or just another colorful item to put on display. It’s as easy as putting things in a jar. Even if you use mason jars for their originally intended purpose such as storing spices, making fancy custom labels for them adds decor value as well. You can grow fresh herbs in mason jars and bundling them up in a pretty basket makes a beautiful and very useful mini herb garden for your kitchen. Make this lovely 4 compartment organizer for kitchen utensils. It will add a rustic accent to your decor, not to mention it is really convenient. Want a unique accent in your kitchen decor? Build this whimsical DIY mason jar chandelier. The project is a little bit more involved but it’s all worth it if you like this style. You may enjoy these easy to make tiki torches in you backyard. It takes no more than 5 minutes to make them, given you have the required supplies. Make a pretty nightlight from a mini mason jar. It will give you that gentle glow at night and you can choose your own shade of color by painting it. Create these easy to use condiment jars and add chalkboard labels to mark them easily. They make the perfect condiment dispensers. Want a whimsical decor accent that goes with a rustic style very well in your bathroom? Make this mason jar vanity light. 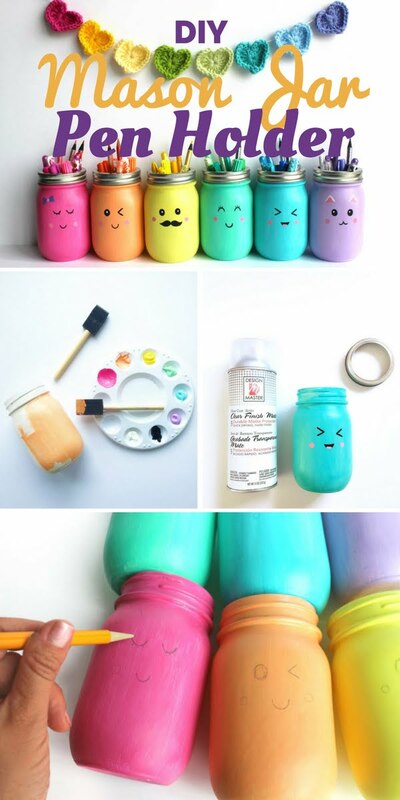 We have a few different ways to paint mason jars on this list, and here’s another cool way to do it. 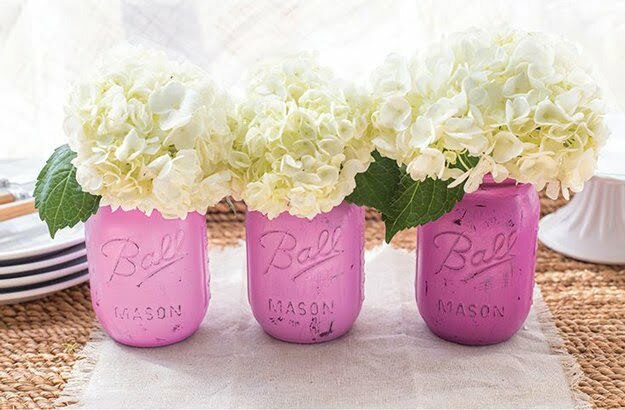 An array of mason jars painted in ombre colors will make a stunning centerpiece or a vignette.